Summertime is all about having fun under the sun, and one of the best places to let loose and enjoy the warm weather is Knott’s Berry Farm. This 160-acre theme park in Southern California is less than 10 miles from Disneyland, so it’s easy to visit both parks during the summer. Knott’s Berry Farm isn’t as crowded as Disney, but its excitement level is quite similar. The park is divided into themed areas with a variety of rides, attractions and shows to enjoy. It’s easy to navigate the property, so you can actually explore according to your interests. You may want to begin in Ghost Town, which perfectly represents the quintessential abandoned Western village. Upon arrival, you can climb aboard an authentic vintage locomotive for a quick trip around the park to plan your day. Ghost Town is also home to the classic Calico Mine Ride, the Timber Mountain Log Ride and Bigfoot Rapids. Once you get ultra-soaked at the splash zones, you can dry off in the warm sunshine at the Boardwalk. Along with a great selection of rides, there is a midway of cool carnival games. From there, check out the colorful Mexican themed attractions at Fiesta Village, and don’t forget to leave a few hours for Soak City. This wild water park features a wave pool, various slides, a lazy river and even a children’s lagoon. 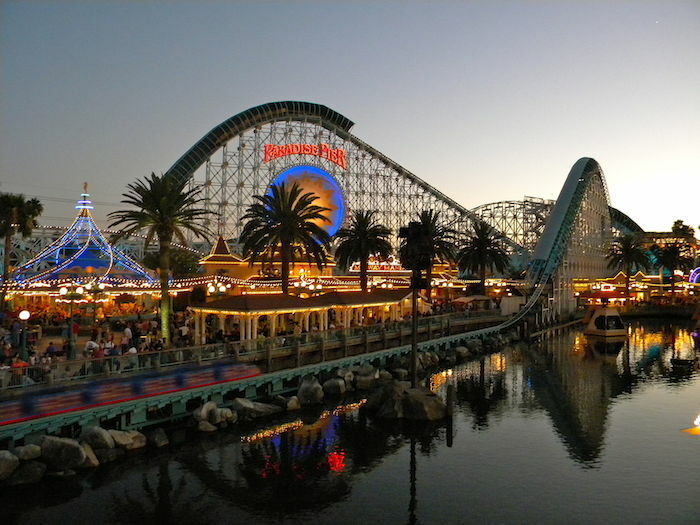 One of the best aspects of Knott’s Berry Farm is that it has a decent collection of both exhilarating and gentle rides. It’s truly a family oriented park, and nothing proves that more than Camp Snoopy. This is a child’s dream world full of bold colors and cute characters. It contains quite a few mild rides for little ones of all ages, including Pig Pen’s Mud Buggies and the Flying Ace. There are also coasters for the older, braver kids. If you’re seeking more grown-up thrills, make sure you ride the Ghost Rider and Silver Bullet while in Ghost Town. You’ll also have a chance to spin, twist, soar and dip on the Pacific Scrambler, Boomerang, Coast Rider and Xcelerator at the Boardwalk. In Fiesta Village, don’t miss out on Montezooma’s Revenge and Jaguar. Montezooma’s Revenge shuttles you upward at a thrilling speed, and Jaguar takes you above various points of the park. Special events take place all year at Knott’s Berry Farm, but the summertime seems to bring a new vibe. From the Mother’s Day Champagne Buffet to the Memorial Sunday Fireworks Display, there is a very celebratory energy in the summer at the park. Beginning in May, the new Voyage to the Iron Reef ride will add to the excitement. This 4-D attraction is basically an interactive battle between guests and underwater creatures attempting to destroy the park. All the park shows and live entertainment are unmatched, and many performances are based on the themed lands. Whether you prefer the special effects and storytelling presentation of the Mystery Lodge, the variety acts at the Calico Saloon or the Old West stunt show, you won’t experience one minute of boredom. There is even an amusing musical performance for tots at the Camp Snoopy Theater. Unlike many other adventure parks, Knott’s has an old-fashioned, inviting charm. This is particularly evident in some of the quaint shops and restaurants. Take a step back in time at the General Store, the Indian Trails Shops, Berry Market and Candy Parlour before settling down for a relaxing meal. Some of the more impressive dining options include Mrs. Knott’s Chicken Dinner Restaurant, Papa Loca and the Churro Factory. There really is an extraordinary selection of attractions at Knott’s Berry Farm, and you’ll have plenty of opportunities to giggle, scream, cool off or just relax. Whether you’re a local or you’re visiting the Anaheim area on vacation, we highly recommend experiencing this one-of-a-kind fun zone. No matter how you spend your time there, you’ll make lifelong memories with the ones you love.